Physical Education is not the easiest subject to organize boards, but is definitely attainable with dedication and clear purpose in mind. This year I moved to a new school and thanks to the principal’s vision we have a display policy in place that regulates the way we communicate students’ learning, actions and outcomes. The PE department has allocated a generous corridor with plenty of pin boards where we have the opportunity to showcase and advocate for the quality of our programme. In this post I will share some examples of displays that fit best our learning context. I want to start with a display where grade 3 students express their suggestions and actions that they will take as a result of their knowledge, understanding and skills acquired in the unit. Inspired by Kath Murdoch’s book – Power of Inquiry – I have deepened the questioning empowering students to communicate their thinking effectively. To be concise, I will just point out what we have displayed, mentioning that some displays are work in progress, as they are part of a learning continuum that we aim to illustrate. This is a practice that I enforce at the beginning of each year with the cohorts of students that I teach: we discuss together what makes our PE environment safe and enjoyable for learning. We reach consensus, then students write down their group statements and we all sign the poster. We define ourselves as a team of learners and we often go back to our agreements to refresh or highlight their importance. We post the approaches to learning in both English and Arabic, and we add relevant pictures for each of the five skills categories. We have a similar display with the IB Attitudes . This is the core of our activity and the posters communicate and illustrate snapshots of the Teaching Games for Understanding approach that we employ in our school. I created collages that evidence students’actions and the intended learning outcomes. On this board I choose students’ reflections, games creation outcomes and learning continuum, that evidence the formative and summative assessments of various units. As other displays exemplified in this post, this is a dynamic one that gets refreshed on unit basis. Finally, I got to organise the Wonder Wall and give it the attention it requires. I made a poster with each grade and the name of the unit. Our students write their questions on post-its during or after group inquiry, pre-assessments, provocations and exit permits. We answer all the questions and we encourage students’ agency by informing our planned and taught curriculum. By using the white board we invite students to communicate how they feel about their learning, through Smiley Faces and Traffic Light tools. I find these tools effective at the end of the sessions: some students help organizing the equipment while others communicate their learning. I also encourage social and communication skills by asking them to share their learning with a peer (Think. Pair. Share.) or by letting them justify their reflection. I would be happy to hear about your ideas and suggestions, or even more, to see how you advocate for the quality of the PE programme at your school. In my next post, I will be sharing a personal reflection following Kath Murdoch’s workshop that I attended last month. I intend to share some of the pedagogic approaches, strategies and tools that can enhance our activity in the PE environment. Have fun and keep it simple! As educators, we are responsible for learning and in order to check for understanding to be useful we need to look for effective strategies in our planning. The PE Postcard is one of the great on-going, formative assessment I use with my students. I believe that the formative assessment serves to improve instruction and to provide student feedback and when used consistently, and used well, the great majority of students should be successful. We use the PE Postcard as an “exit-ticket” where students write about their learning for the day, or answer a question. 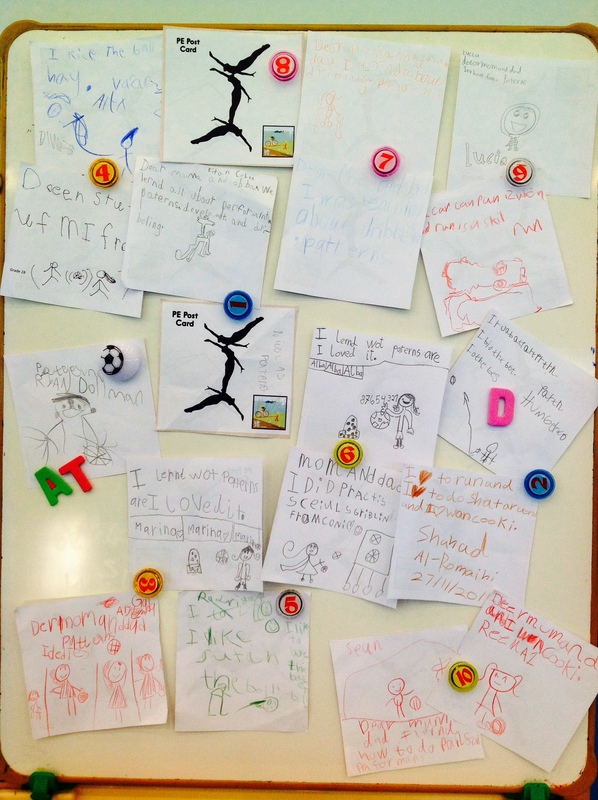 In this grade 1 example we have asked the students to write a postcard to their parents, mentioning the skills and at least one of the PE related concepts that we have inquired about. In the current Individual Pursuits stand-alone unit we inquire using the following related concepts: Patterns, Development, and Performance. When the activity is done we are placing these postcards in their homework folders. I was happy to see that most of them could identify the concept of Patterns through the learning experiences they have been performing. What’s your strategy to check for understanding that you want to share?